I recently wrote about a mind-boggling event: astronomers capturing what are apparently the final moments in a star’s life as it was literally torn apart by a black hole. I know, it may not look like much at first. But remember what you’re seeing: the violent death of a star ripped apart by the gravity of a black hole… and it’s happening 3.8 billion light years away! That’s about 40,000,000,000,000,000,000,000 kilometers, so the fact that we can see it at all is pretty amazing. And terrifying. In this false-color Hubble image, the galaxy and explosion are marked. Pretty much everything you see in the picture is a distant galaxy, a billion of more light years away. Normally, the host galaxy itself would appear as a dot, at best with some small amount of fuzz around it, the glow of billions of stars reduced by the incredible distance. But the dying light of the star increased the galaxy’s brightness by a lot. A whole lot. This image (click to greatly embiggen!) is a combination of visible light (white), ultraviolet (purple), and X-rays (yellow and red) from NASA’s Swift observatory, the satellite that first detected the explosion. While the spikes are not real – they’re just an optical effect from the telescope itself – it still speaks to the drama of what we’re seeing. And so just what are we seeing? Imagine: what may have been a normal star not much different than the Sun was orbiting the center of this distant galaxy, very close indeed to the middle. In the core of every big galaxy there lies a monster: a supermassive black hole which may have millions or even billions of times the Sun’s mass. This one at the heart of this unnamed galaxy may have topped off at half a million solar masses. The gravity from such an object is fierce. But worse, the strength of gravity fades with distance. That may seem like a saving grace - being farther from a black hole means its gravity is diminished - but in fact that’s what spelled doom for this star, because that drop in strength can be very sharp for a black hole. As the star approached this bottomless pit, the side of the star facing the black hole was pulled far harder than the other side of the star, which may have been a million or more kilometers farther away from the black hole. 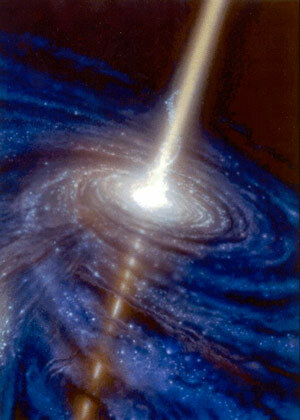 This change in pull stretched the star – this stretching is called a “tide”, and is essentially the same thing that causes tides on the Earth from the Moon’s gravity… and when the star wandered too close to the black hole, the strength of that pull became irresistible, overcoming the star’s own internal gravity. 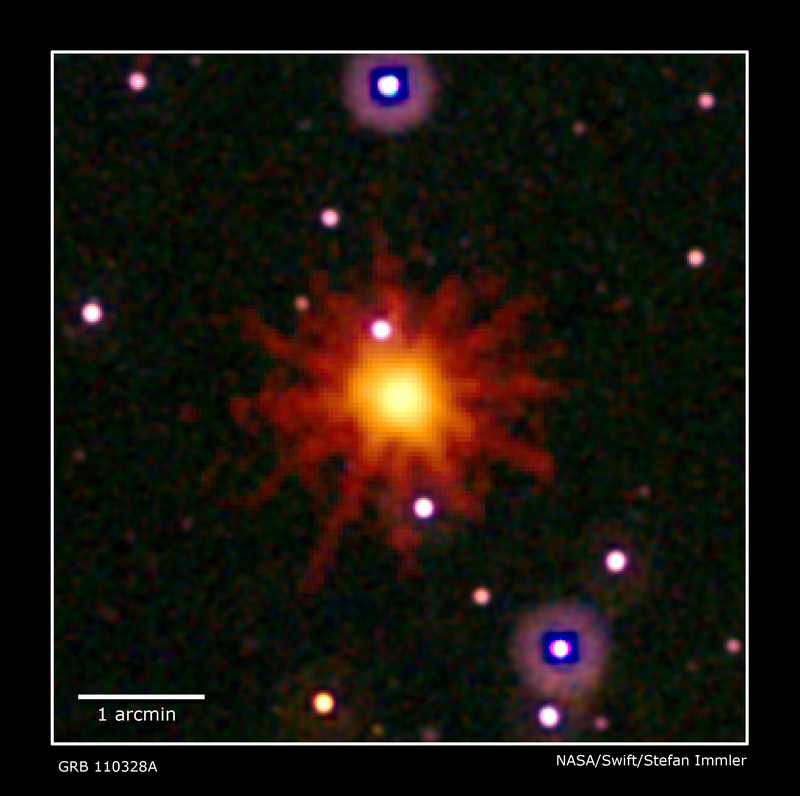 In a flash, the star was torn apart, and octillions of tons of ionized gas burst outward! This material whipped around the black hole, forming a disk of plasma called an accretion disk. Magnetic fields, friction, and turbulence superheated the plasma, and also focused twin beams of matter and energy which blasted out from the poles of the disk, away from the black hole itself. The energy stored in these beams is incredible, crushing our imagination into dust: for a time, they shone with the light of a trillion Suns! As it happens, the disk that formed around the black hole was face-on to us, so one of those beams was essentially aimed directly at us. Had we been in that galaxy at the time and in the path of that beam, well, the Earth would’ve been in a bad way*. But from our distance of nearly four billion light years, the flash of light was only bright enough to see with big telescopes. And this event is not over. As the material whirls around the black hole, turbulence and other forces inside the disk can cause the brightness to change. There have been several flares, and while it had been fading for a few days, suddenly on April 3rd the overall brightness increased by a factor of five! Astronomers will continue to watch this spectacular event for quite some time, certainly until it finally fades from even the sight of powerful telescopes like Hubble. Over the years I’ve studied some of the most energetic events in the Universe: exploding stars, gamma-ray bursts, magnetar flares. 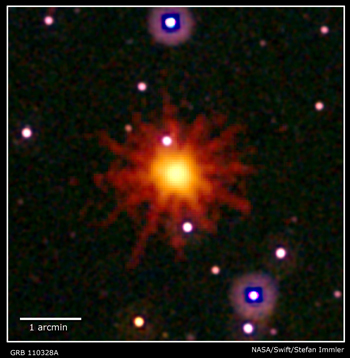 These cosmic blasts are so huge they are impossible to fully grasp with our puny minds – understand them, yes, but truly grok them, no – and it’s amazing to me that there are still other things out there that can release such devastating amounts of energy. And I’m very glad they happen so very far away! Image credits: Hubble: NASA/ESA/A. Fruchter (STScI); Swift: NASA/Swift/Stefan Immler; Jet illustration: Don Dixon/NASA/JPL-Caltech. * And by “bad” I mean very very very very very very very bad.